Powerful lithium ion battery pack compatible with all STIHL cordless machines. The battery pack can be charged several hundred times without significantly decreasing the capacity, no memory effect and constant power while in operation. Allows operation for long periods, just like a gas machine. Includes a charge level indicator with four LEDs for indicating the charge level. Rechargeable with STIHL charger AL 100, AL 300 or AL 500. 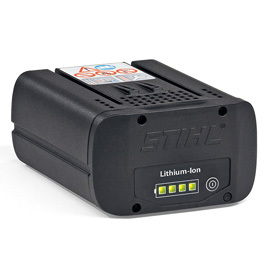 Running times with compatible batteries can be found in the individual product page.